French Silk Pie is velvety, decadent, and ridiculously easy to make! This chocolatey dessert is made with a buttery crust and a mousse-like filling that’s piled high with homemade whipped cream! 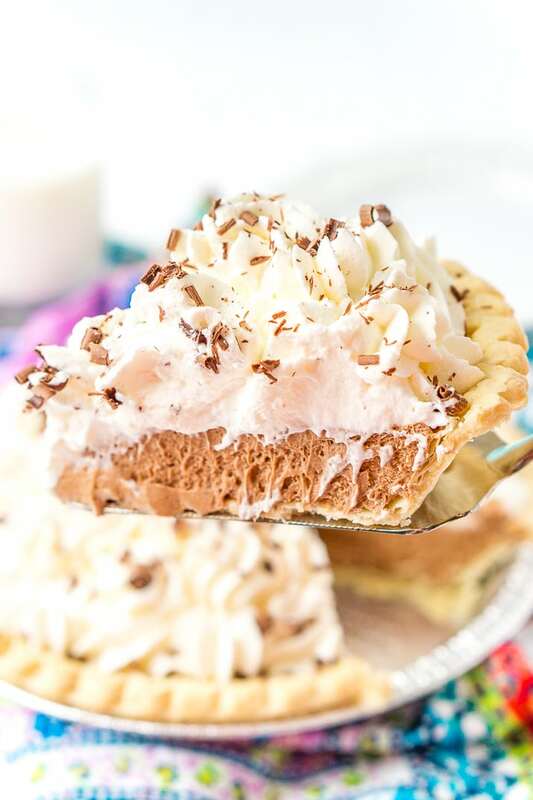 If you love chocolate, dessert, and easy-to-make recipes, this smooth and creamy French Silk Pie checks all those boxes! 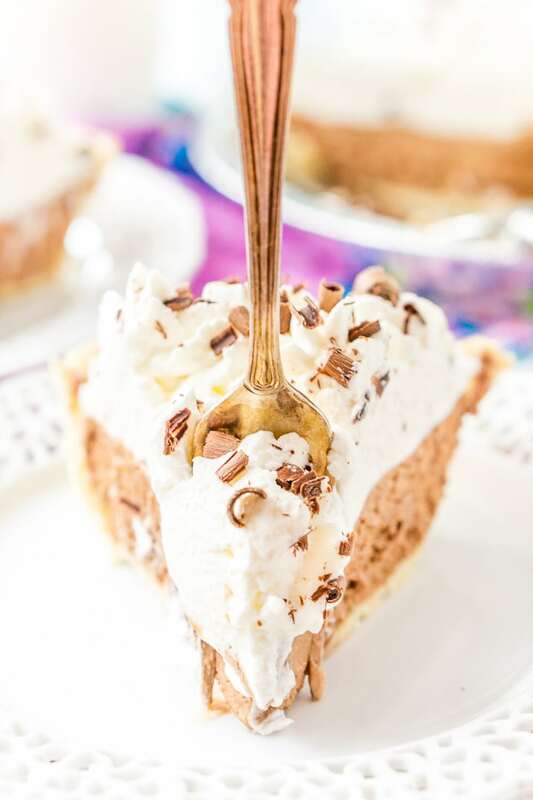 When you’re looking for a quick, crowd-pleasing treat to share with friends and family this season, you have to try making this scrumptious Silk Pie! It’s perfect to serve after a dinner you’ve hosted or to bring to someone else’s house if you’re invited as a guest. JUST TAKE ME TO THE FRENCH SILK PIE RECIPE ALREADY! 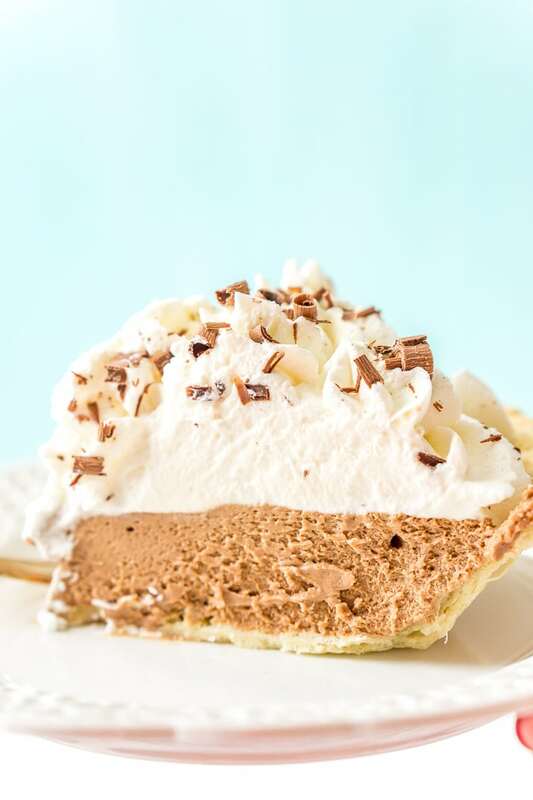 If you’d rather skip my (very helpful, I think) tips and tricks, essential cooking info, and similar recipe ideas – and get straight to this deliciously easy Best Ever FRENCH SILK PIE Recipe – simply scroll to the bottom of the page where you can find the printable recipe card. 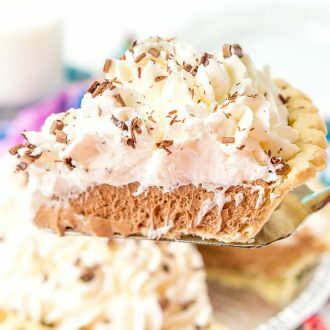 French Silk Pie is a rich and decadent American dessert recipe (not actually French) that consists of a whipped chocolate mousse filling nestled in a flaky pie crust and topped with fluffy whipped cream. This recipe is actually quite easy and doesn’t require a lot of technique or skill. The biggest thing you need to pay attention to are the timing and temperatures in the recipe. See more notes on those a few paragraphs down. 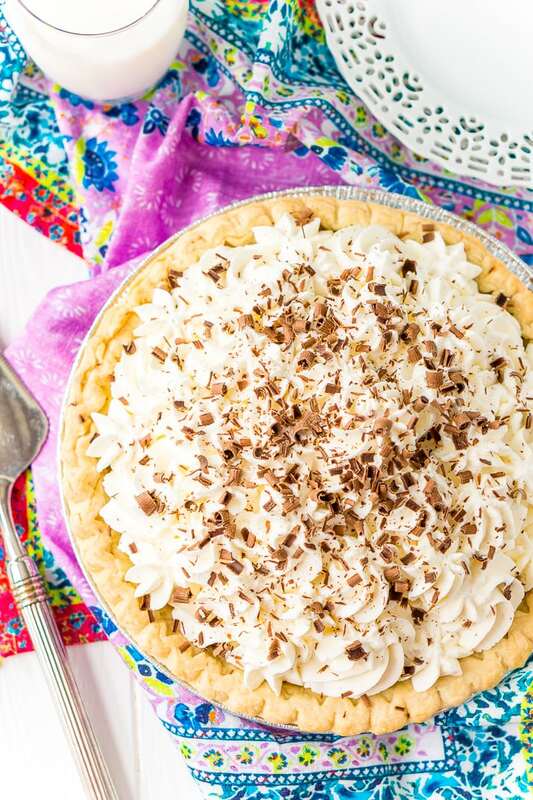 To make French Silk Pie, begin by preparing your crust. You can use your favorite pie crust recipe, a refrigerated dough, or frozen dough. Cook your pie crust according to the directions for a no-bake filling. Usually, this means you’ll need to make sure the crust is thawed and poke the crust all over with a fork before baking for 10 to 15 minutes. Let the crust cool completely before adding the filling. Next, it’s time to prepare your filling using a large bowl with a hand mixer or stand mixer fitted with a paddle attachment, cream the butter until smooth and slowly add in the sugar while beating on low to medium speed. Once all of the sugar has been added, beat on medium speed for 2 minutes. The mixture should be pale and fluffy. Scrape down the sides as needed. If you’re using a stand mixer, switch to the whisk attachment, add in the cooled chocolate, almond extract, and vanilla extract and whip on medium speed for 2 minutes. Next, add in 1 egg and start mixing on low until the egg is incorporated and then increase the speed to high and beat for 5 minutes. Then, add in the remaining egg and beat on low until incorporated and then increase to high speed and beat for 5 minutes more. DO NOT SKIMP ON TIME. Finally, pour the filling into the prebaked pie crust and transfer to the refrigerator to set for at least 4 hours, preferably overnight. Just before serving, top with whipped cream and chocolate curls. French Silk Pie filling is made with butter, sugar, 60% chocolate, vanilla and almond extract, and eggs. For the crust, you can use your favorite recipe, or opt for a store-bought version to save some time! French Silk Pie Has RAW Eggs? Is It Safe To Eat? This is a bit of a loaded question, but the answer is: Yes. That being said, those who are pregnant, elderly, and children should probably not eat this pie. Even though there is very little health risk associated with it, these people are at higher risk for illness. So it’s best just to be careful. French Silk Pie is essentially a Chocolate Mousse Pie and chances are you’ve all enjoyed a delicious bowl of chocolate mousse without even realizing that it contained raw eggs. The important thing is to take care in selecting your eggs and preparing your pie. Your safest option is to purchase PASTEURIZED EGGS. Just like pasteurizing milk, pasteurized eggs have been heated enough to kill bacteria without actually cooking the egg eliminated the risk of getting sick. If you are unable to find pasteurized eggs, fear not, you can also follow this guide for cooking with raw eggs. It will walk you through the steps for safely using free-range eggs to make this pie. You sure can! This pie freezes remarkably well and you can freeze it for up to 3 months. However, I highly recommend freezing it without the whipped cream topping and making that fresh before serving. Transfer the pie to the refrigerator 4 hours before serving to give it time to thaw. Time: The mixing times in this recipe are so important and should not be shortened or you will end up with a grainy underdeveloped filling. The times are crucial to a silky filling that fills a 9-inch pie just below the crust line. This leaves plenty of room for some fluffy whipped cream. Temperature: While this pie requires very little baking (just the crust), it’s incredibly important that the eggs are room temperature. If the eggs are cold when added to the filling mixture, they will not fluff up. This could cause your filling to be running or lacking in volume. Another note on the temperature is that while the chocolate needs to be melted. It’s vital that you allow it to cool before adding it to the mixture AND that you allow the crust to cool completely after baking before filling it. If either of these is too hot it could impact the integrity of the filling. Crust: Make sure to bake your pie crust according to the directions for a no-bake filling. Usually, this means the crust will have to be thawed and you’ll need to poke it all over with a fork before baking for about 10 to 15 minutes. If the crust still puffs up even if you poked it with a fork, simply use a cake tester or toothpick to poke the center. This should release the air and the crust should deflate. Another Crust Tip: make sure to let the crust cool completely before adding the filling, otherwise, it’ll start to melt and won’t set. Substitutions: In my opinion, there aren’t any. You could use a store bought whipped cream. But really, why would you after you’ve made such a luscious filling. Top this baby with the REAL good stuff! French Silk Pie Is A Crowd Pleaser! French Silk Pie is topped with an airy layer of whipped cream — I prefer this homemade recipe! Add chocolate curls as a garnish, and it will look extra fancy, plus there’s no such thing as too much chocolate! Savor a piece of this decadent dessert alongside a frothy cappuccino, a glass of red wine, or some bubbly. Whether you’re hosting the in-laws for dinner or you’re in charge of dessert this Christmas, this Silk Pie is just as elegant as it is easy to whip up. If you serve French Silk Pie, get ready to receive lots of accolades and prepare to make it again! This rich and velvety dessert is perfect to share with loved ones for the holiday season and beyond. French Silk Pie is velvety, decadent, and ridiculously easy to make! 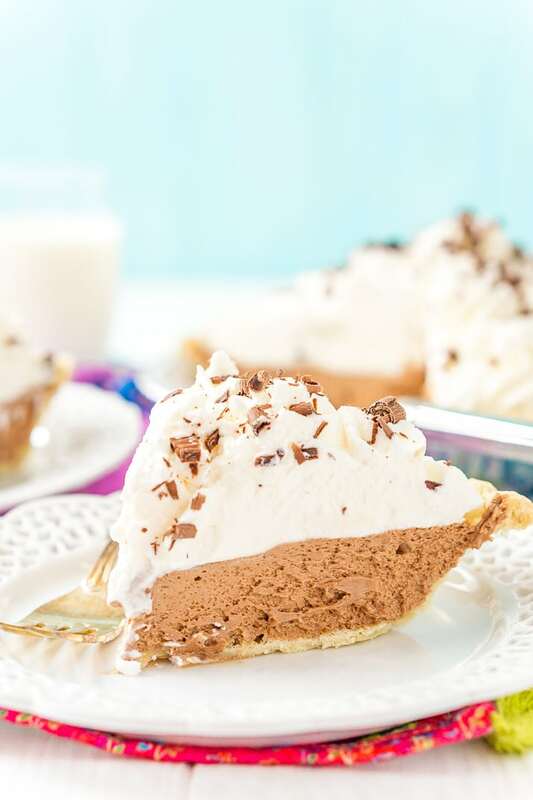 This chocolatey dessert is made with a buttery crust and a mousse-like filling that's piled high with homemade whipped cream! You can use your favorite pie crust recipe, a refrigerated dough, or a frozen dough. Cook your pie crust according to the directions for a no-bake filling, usually, this means you'll need to make sure the crust is thawed and poke the crust all over with a fork before baking for 10 to 15 minutes. Let the crust cool completely before adding the filling. Filling recipe is meant for a 9-inch pie. In a large bowl with a hand mixer or stand mixer fitted with a paddle attachment, cream the butter until smooth and slowly add in the sugar while beating on low to medium speed. Once all of the sugar has been added, beat on medium speed for 2 minutes, the mixture should be pale and fluffy. Scrape down the sides as needed. If using a stand mixer, switch to the whisk attachment, add in the cooled chocolate, almond extract, and vanilla extract and whip on medium speed for 2 minutes. Add in 1 egg and start mixing on low until the egg is incorporated and then increase the speed to high and beat for 5 minutes. Add in the remaining egg and beat on low until incorporated and then increase to high speed and beat for 5 minutes more. Pour the filling into the prebaked pie crust and transfer to the refrigerator to set for at least 4 hours, preferably overnight. Just before serving, top with whipped cream and chocolate curls. I love adding just a touch of almond extract to my French Silk Pie, but if you don't enjoy the flavor, simply omit it.